If you were an Ulmer, you would almost certainly have read or heard about the restoration of the “Schiefes Haus”, and probably also visited the site to see the new face of this landmark building. Yet Ulmers and strangers alike are curious not only about the facade, but about how the widow of the Tailor of Ulm used to live. Would you like to feel what it is like to live in a building that is more than 500 years old, and whose walls tell tales of by gone days? 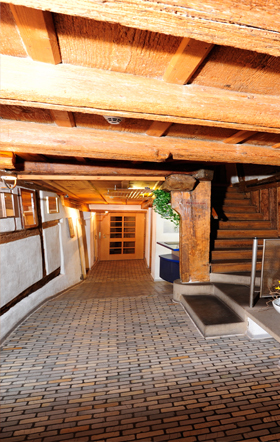 Hotel “Schiefes Haus” offers you this very experience. Enjoy the ambiance and comfort of our house and the fishermen's quarter, by yourself, with friends, family or business partners. It is our prime objective to preserve the historic character of this house, harmoniously incorporating the comfort of modern accommodation. Book your stay and support the conservation of one of the oldest and most beautiful houses of Ulm.